(CNN) — Aaron Swartz helped create the Internet. Maybe not the Internet foundations of ARPANET and TCP/IP and Mosaic, the codes and packets and standards on which the whole thing is based. But he was a factor in fashioning some of the Web’s upper floors. With his contributions to RSS coding and the Web application framework, Swartz made some of today’s more expansive Internet possible. But what Swartz also helped create was a philosophy of the Internet, one that remains the subject of great controversy almost 20 years into its life: the libertarian idea that information wants to be free. Although Swartz’s life was not without controversy — he faced federal charges that he illegally downloaded millions of scholarly papers from MIT — his death has been met with an outpouring of tributes and grief. A Tumblr page was set up for people to express their thoughts and condolences. Friends and commenters there described him as “inspiring,” “enthusiastic,” “a hero,” “shy,” “a great technologist” — a bright, inquisitive, creative, challenging personality who deeply affected those he touched. “Such a brilliant, disciplined, well-spoken guy with a great sense of humor, who probably knew as much about ‘Star Wars’ mythology and trivia as he did about programming computers,” wrote a member of Chicago Force, a “Star Wars” fan club, noting the shock of club members in 1999 when they met with the budding Web developer and discovered he was just 12 years old. “World wanderers, we have lost a wise elder. Hackers for right, we are one down,” said World Wide Web creator Tim Berners-Lee in a tweet. Swartz was apparently committed to such activism from an early age. He was born in Chicago, the son of a software company founder, and showed both intellect and restlessness at an early age. He would have been 13 at the time. Swartz never really gravitated to old-fashioned schooling; after his blog note, he mainly studied at home. He enrolled at Stanford in 2004 but only stayed a year, saying he didn’t find “a very intellectual atmosphere” on the campus at the edge of Silicon Valley. He later became a fellow at Harvard University’s Ethics Center Lab on Institutional Corruption. Swartz was a prodigy. By the time he was 14, he had co-written the specification for RSS — originally Rich Site Summary, now Really Simple Syndication — a Web-publishing technology for delivering syndicated content from frequently updated sites, such as blogs or news websites. RSS allows Web consumers to receive the latest stories on a feed without having to constantly revisit their favorite pages. If you subscribe to a podcast — or receive automatic updates from CNN.com — you have Swartz to thank. After leaving Stanford he created Infogami, which was later merged with Reddit, the freewheeling social-news site where users vote their favorite stories onto the main page. Reddit, which was purchased by Conde Nast in 2006, has come under fire for its anything-goes ethos. One popular Reddit moderator, who went by the name Violentacrez, was known for starting Reddit pages devoted to underage girls and violent fantasies. When his identity became known via a Gawker article, he was fired from his job. Swartz was long gone from Reddit by then — he was let go just after the Conde Nast purchase — but believed in the ethos of the site and the open Internet in general. “(He) engineered his own dismissal and got cashed out, and then became a full-time, uncompromising, reckless and delightful s***-disturber,” wrote BoingBoing’s Cory Doctorow, a friend of Swartz’s, in a tribute. One of Swartz’s desires was to make public information truly public — that is, free and easily available. There’s a government-run system, PACER, that allows the public to access court records online. However, PACER charged a fee for accessing this public-domain information. As Doctorow observed, Swartz “singlehandedly liberated 20% of U.S. law” by moving the information onto a public site, spending “a small fortune” of his own money doing so. Later, Swartz founded Demand Progress, a group devoted to Internet activism. For all his success with programming, it’s in this arena that he had the most impact, said Soghoian. Demand Progress was instrumental in fighting the Stop Online Piracy Act and the Protect IP Act, two bills that would have expanded government oversight in fighting Internet piracy and copyright violations at the possible expense of the free flow of information. “He really, really believed that public information should be free and accessible to everyone,” said Soghoian. By the time SOPA and PIPA were shot down last year, Swartz had become entangled in another legal thicket surrounding free access to online data. According to federal prosecutors, Swartz used MIT’s computer networks to download more than 4 million articles from JSTOR, a digital library of academic journals, in 2010 and 2011. He was charged with wire fraud, computer fraud and other crimes, even though JSTOR declined to prosecute and urged the government to drop the case. “What Aaron was accused of by the government (was) essentially a serious form of computer hacking,” said Soghoian. 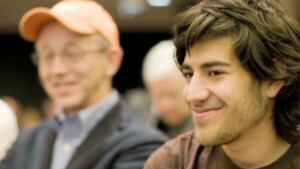 If found guilty, Swartz could have been sentenced to up to 35 years in jail and a $1 million fine. Soghoian was one of many observers surprised at the severity of the charges. “These are the kinds of things you’d assume the government would use in a serious hacking case — identity theft, millions of credit card numbers stolen, hacking into protected government databases or corporate networks,” he said. “Aaron was accused of downloading too many articles from a website that anyone connected to the MIT network could log into. Swartz’s family was equally pointed. “Aaron’s death is not simply a personal tragedy. It is the product of a criminal justice system rife with intimidation and prosecutorial overreach. Decisions made by officials in the Massachusetts U.S. Attorney’s office and at MIT contributed to his death,” they said in a statement. Christina DiIorio-Sterling, a spokeswoman for the U.S. Department of Justice, declined to comment to CNN on Swartz’s case, citing respect for his family. Soghoian, the ACLU’s analyst, said he sees Swartz’s death as a great loss. Swartz could have made a fortune as a start-up wizard or venture capitalist but instead he plowed what money he made into his activism, he said.